On my way to create the last post published below (about the DMSP image of Earth at night), I came across something that really impressed me. It was a video of cities at night taken by astronauts from the ISS (International Space Station). A little later, I found an article that explained in details what that video was about. To make a long story short: astronauts used to take Earth pictures from space, but they couldn’t avoid blurring due to the ISS velocity relative to the Earth’s surface combined with the exposure time required to capture night lights. 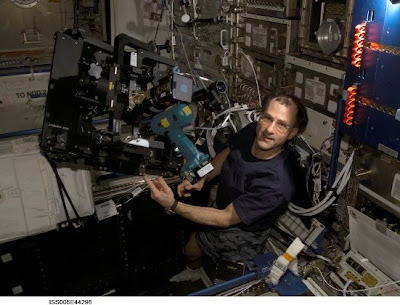 A solution to this problem was finally obtained by the astronaut Dan Pettit, who managed to create the system showed below to compensate the Space Station movement in order to get sharp images. The outcome of this system was an impressive set of images from Earth cities, with about 60 meters of estimated resolution. These pictures were taken at night, when is easier to catch a realistic view from the spatial distribution of the cities. Finally, Dan Pettit himself assembled a video from these images, in which he guides us in a tour around the world to discover the beautiful configuration of cities from different parts of the planet – and the implicit cultural differences that lay under the historical process of these cities formation. You can find here a high definition version for the movie above.